In Real Life, by late 2004 almost half of the founding members of the GBWC (Peter Kong, Leon Hogan, Robert Griffiths, and Mike Chad) had sort of drifted away from the Ghostbusters community. And Ludicris (Joey Williams) decided to step down as CEO of the team, asking me to take over. In conjunction with the rest of the still-active team, we set out to plot out more of the team's fate after the events of "Chronicles of Gozer". We decided that it was time to prune the team and revamp it, to better reflect reality. The "absent" members were reclassified as Reservists, so that if they decided to show up again, they could easily be written in. 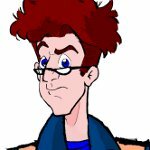 I'd suffered some setbacks in Real Life that I decided to reflect in my character, meaning he'd serve more as a mentor role (like Egon in EGB). And I'd had ideas for how to have that happen to the fictional version of Fritz, which eventually became the story "Where In The World Is Chelsea Aberdeen?" Andy's idea was to have some of the team serve with GBTN for a while. Jeff was being trained as a ninja by Sub Zero.